As is Tales of Symphonia. Two diametrically opposite games are currently enjoying free Steam weekends. 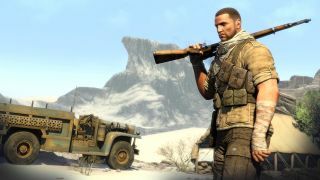 The first is Sniper Elite 3, Rebellion's stealthy, shooty game set in North Africa during World War 2. You can play it for nowt for the next day and a bit, and if you want to keep it after that, there's a hefty 80% discount. Tyler Wilde thought "70%" when he reviewed it back in 2014, and yes, he actually said "70%" (we have an algorithm at PC Gamer that converts our numerical utterances into procedurally generated text). Anyhoo, there's yet another game free on Steam this weekend, and to my knowledge it doesn't feature any Nazis or indeed sniper rifles. It's Tales of Symphonia, Bandai Namco's (or Namco Bandai's, I can never remember) colourful JRPG. The game was recently remastered and punted onto Steam; we don't appear to have a review, but Daniella Lucas was rather fond of its sequel, Tales of Zestiria. Again, you have just over a day left to have a go on Tales of Symphonia, and there's a 66% discount if you'd like to keep it.